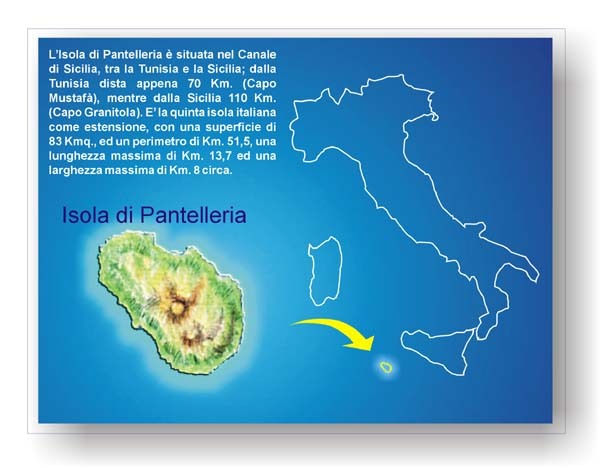 The island of Pantelleria lies in the Channel of Sicily, 70 km from the Tunisian coast (Mustafà Cape) and 110 km from the Sicilian coast (Granitola Cape). Its area of 83 sq. km. makes it the fifth largest Italian island. Its perimeter measures 51,5 km, its maximum length is 13,7 km and its maximum width measures about 8 km.